OSWEGO, N.Y – An Erosion Management for New York’s Great Lakes Shoreline guide is now available from New York Sea Grant. The 16-page guide can be downloaded for free online at http://bit.ly/2IoF1F4 or requested from New York Sea Grant at 315-312-3042. An Erosion Management for New York’s Great Lakes Shoreline guide is now available from New York Sea Grant. 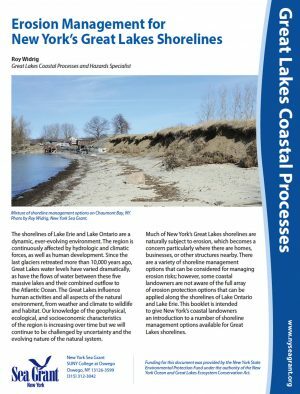 “Erosion is a natural process and shorelines in the Great Lakes region are constantly changing shape. Developing an understanding of the natural processes at work and identifying the level of protection needed for specific sites are important considerations in planning a project,” said guide author Roy Widrig, a Coastal Hazards and Processes Specialist with New York Sea Grant, Oswego.